The first annual Chardon School District Juried Art Exhibit is coming soon! Every student from kindergarten to 12th grade who participates in art will have a piece displayed. 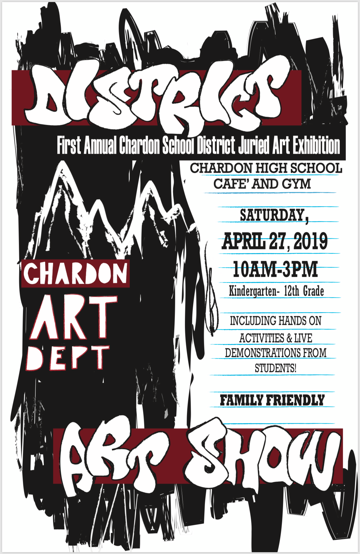 This family friendly event will take place on Saturday, April 27, 2019 from 10 am-3 pm in the Chardon High School cafe and gym. Free hands on activities will be available during this open house including 3d pens, High school student caricatures, pottery wheel demonstrations and more! Free refreshments are also available. Every student who attends will get a raffle ticket to enter for amazing prizes! So, bring your family to this fun and amazing free event!